On the cover of the September, 1962 Gasket Gazette was Oklahoma Region’s largest to date purchase, 1 new 1962 Split Screen, nine-window, Volkswagon Van. Powered by VW’s 1.2 liter, 40 hp air-cooled engine, the only options it had were a radio and roof rack. 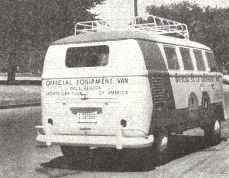 The “Van” as it was known, served the Region for almost twenty years. It is believed to have been purchased at Scovil VW in Norman. 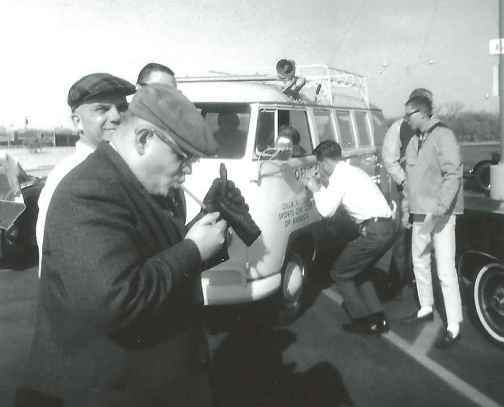 Official records have gone missing in the fifty-two years since the Region bought it, but both Paul Scovil and Bob Simons (see Scovil Ad) were SCCA members, and Simons was a competition driver. In 1962 he was campaigning a Ferrari Mondial. It was usually stored at the Activities Chairman’s house, or Carter-Maxwell Auto Service. Initially all club materials for racing, rallyes and gymkhanas could be stored in the van. But as the club acquired more equipment, items were stored at member’s houses and ferried to events in the van. 1963. Checkpoint workers assemble before a rallye. 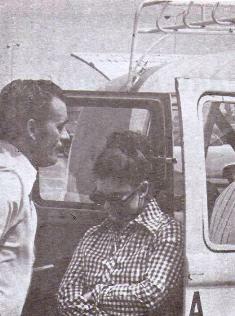 Registration at rallyes and gymkhanas was the most frequent use for the van. The normal routine was the event chairman would pick up the van, load it up with equipment needed and drive to the event. With the side doors open, the registrar was dry and relatively comfortable regardless of the weather. 1964. Streeter B. Flynn fires up while George England looks on. Larry Mattheson fills out his entry form ahead of Charles Shroyer. After rallye registration, the van was often used at a check point, usually the last one since its high profile and bright coloring was easy to see. Gymkhanas, autocrosses and eventually SOLO events were the van’s forte. After downloading the pylons for the event, extension cords were run to AC to drive the PA system and timers. Announcers for the event called drivers to practice and their timed runs, often announcing times to the participants and spectators. It also served as a bulletin board for posting gymkhana scores and results. 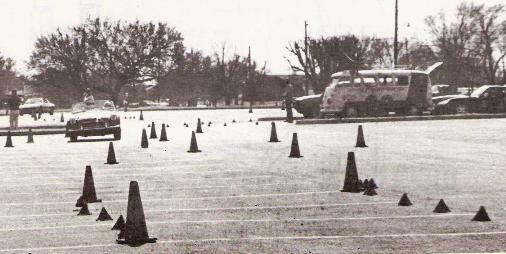 At the races, mainly Ponca City, the van would haul fire extinguishers, flags pry bars, field phones, radios and asbestos gloves to the track on Friday. On Saturday morning the equipment was distributed to the corner stations. Many lunches were ferried to the corners, as was beer and pop after the races. 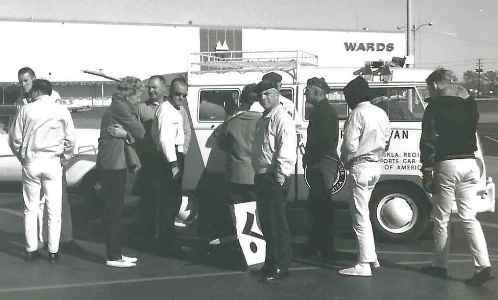 One race story involving the Van that I can relate took place in 1963. Regional Executive David A. Wood drove it to Ponca City Friday evening, arriving at Race Head Quarters, the Miller Motel. A number of rowdies had preceded Dave, and were carousing at the motel pool. 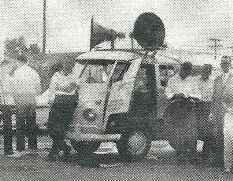 When David arrived he honked the Van’s rather anemic horn, which was taken as a challenge by the rowdies. David was drug, forcibly but with only good intentions, out of the Van and thrown into the pool. He was only given time to remove his watch and wallet. 1967. The Van serves as timing shed. Did the van ever participate in “Naked Laps of Ponca City” ? I don’t know the answer, but perhaps someone reading this article will reveal the truth. 1972. Judi Anderson enters gymkhana times. With only 40 horsepower, and the large PA Speakers on the roof, driving the van to events, especially races at Ponca City, Cushing, Enid and Woodward could be tiresome. In 1964 I had the pleasure ? of driving the van to the July races at Ponca City. I picked up the van early in the week before the races, and engaged Mike Dickey in a true race of fools on Thursday. Mike was currently driving a three-speed Renault Dauphine, so we had a drag race on Douglas Boulevard, South of Tinker AFB. I can’t remember who won, but I was amused that I could go no faster in third than I could in fourth, down shifting to gain some momentum, up shifting to lose momentum. It was a thirty second plus quarter mile. Our trip to Ponca took almost three hours. Evidently I wasn’t the only driver who used all 40 horses with enthusiasm, as the van’s engine was rebuilt in the 70’s. I’m unsure of the date because the Region’s official records before 1976 are currently beyond my reach, and the meeting minutes posted in the Gazette do not discuss the rebuild. I do remember Jerry Maxwell talking about the van having the “old split-case” engine, so a total replacement was advised over a lesser expensive rebuild. The financial records show “Van, Garage and Equipment” expense in 1976 of $1, 683.57. That amount exceeds the average expense for those items by 200%, so 1976 may be the rebuild year. If so, the “old split-case” held up for 14 years! Frank Smith and Jennie Greene Harding wait to register. 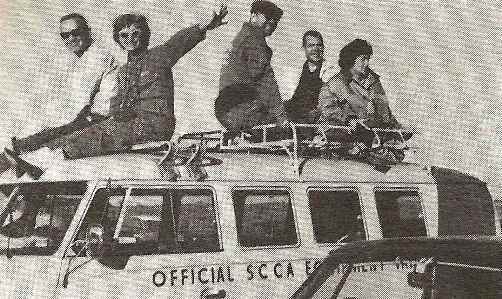 In 1979 the van actually MADE MONEY for the region, as $150.00 van income was recorded. I seem to recall the van was rented to another car club, but again no specific details are available. Mike Anderson recalled that a SOLO worker rolled the van to or from a SOLO event. In the November, 1980 business meeting minutes, “Ray Gahan gave us the news that the van has been badly damaged and we are in need of another vehicle.” I believe Ray was the SOLO Chairman that year.